"America the Beautiful" is one of America's most popular and loved patriotic songs. In 1893 Katherine Lee Bates made a trip across America where she viewed the beautiful sights that inspired her to write a poem on which the song is based. Organist and composer Samuel A. Ward set the lyrics to music. 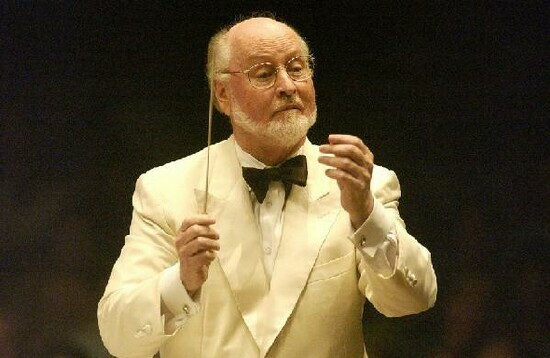 John Williams is an American composer, conductor and pianist. He is considered to be one of the greatest film composers of all time and is called the "master of movie music". In a career that has lasted over six decades, he has composed some of the most popular and recognizable film scores in cinema history. 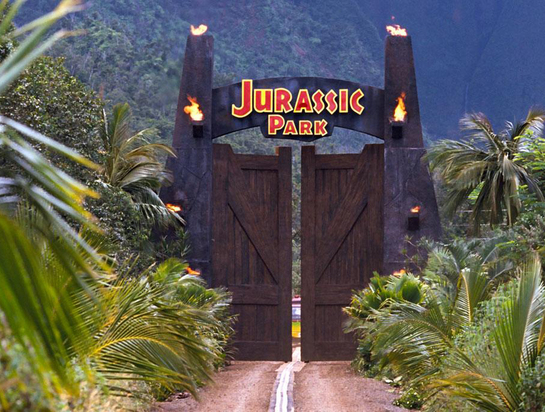 These include Jaws, Superman, E.T., Star Wars, Home Alone, Harry Potter, Indiana Jones, Jurassic Park, and many others. 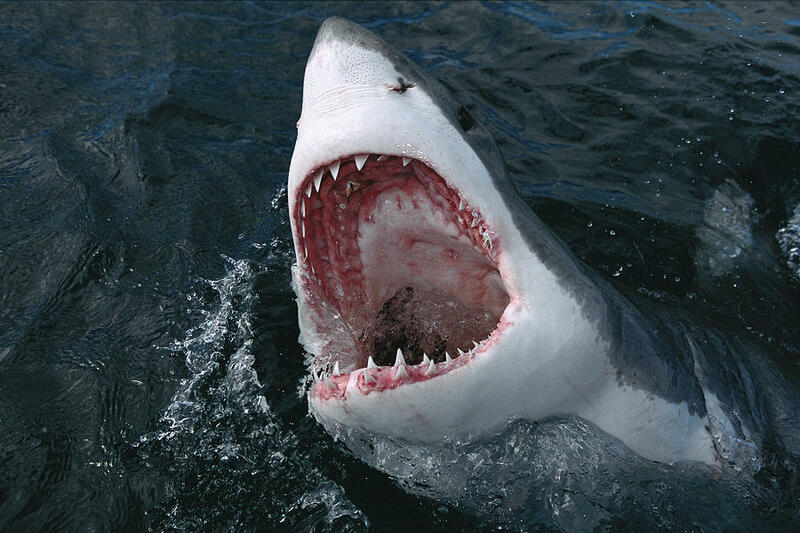 Just two notes represents the shark--two low, ominous sounding notes played by bassoons and double basses. This is a revival of a German music technique called leitmotif. A leitmotif is a phrase or short melody that signifies a character, place, plot element, mood, idea, relationship or other specific part of the film. It is used in modern film scoring as a device to mentally anchor certain parts of a film to the soundtrack. Leitmotifs must be strong enough for a listener to latch onto while being flexible enough to undergo variation and development. When you hear it, you know what is about to appear or happen. Williams has had a long association with film director Stephen Spielberg. He composed the music for all but one of Spielberg's major feature-length films. Williams' style of music combines the lush, full orchestra sound of the romantic era with the modern sounds of 20th century musical language. Born in Long Island, New York, John Towner Williams discovered music almost immediately, being the son of a professional percussionist. He began studying piano at age 9 and continued studying music throughout college. After moving to Los Angeles in 1948, the young pianist and leader of his own jazz band started experimenting with arranging tunes; at age 15, he determined he was going to become a concert pianist; at 19, he premiered his first original composition, a piano sonata. 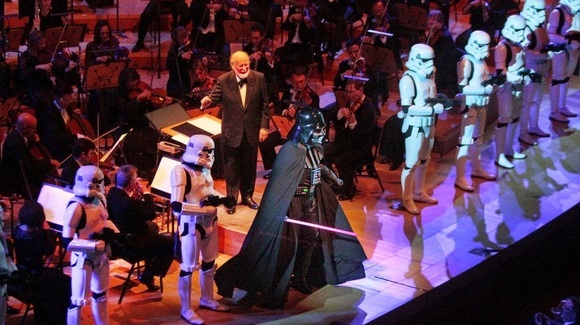 John Williams is honored at a Los Angeles Philharmonic Orchestra gala. Crashing cymbals and a brass fanfare introduce the Star Wars theme. 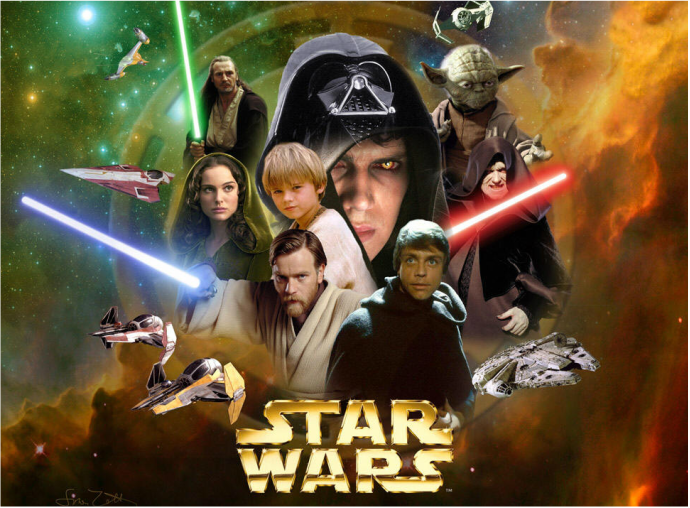 Usually associated with the character Luke Skywalker, this music represents heroism and adventure. The triumphant march begins with trumpets playing the memorable tune that focuses on a high note. A softer, second theme played by the strings provides contrast. 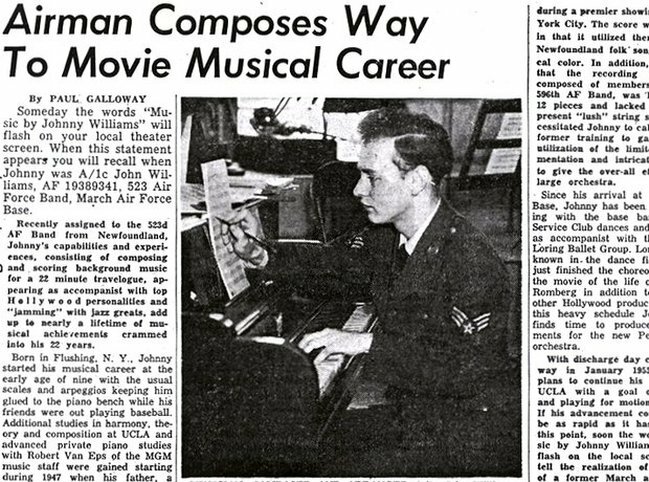 Williams' work as a Hollywood piano player soon led to orchestrating and composing jobs. During the 1970's he composed music for "disaster films" such as The Poseidon Adventure, Earthquake, and Towering Inferno. He also wrote big, brassy music scores for "big, brassy" films such as Raiders of the Lost Ark and Superman. His film work continued through the '80's and '90's. Williams has composed other notable works besides film music. He has written theme music for four Olymic games, NBC Sunday Night Football, the Statue of Liberty's rededication, the TV series Lost in Space and Land of the Giants. He has also composed classical concertos and works for orchestral ensembles and solo instruments. Williams served as the principal conductor of the Boston Pops Orchestra from 1980 to 1993. He has won many awards, and he is the second most nominated award winner after Walt Disney. 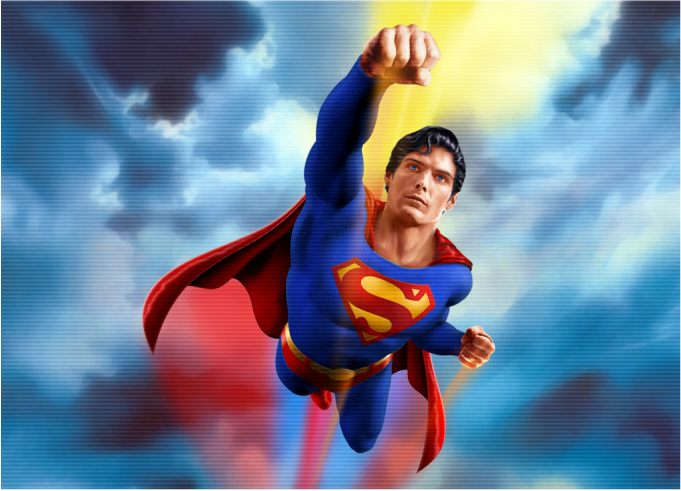 The Superman theme begins low brass playing what is referred to in music as a "horn call", similar to hunting calls long ago. The quick, dotted rhythm that follows creates a sense of both mystery and anticipation as it crescendos (gradually gets louder) into the heroic sounding main theme. While Williams' career in film music flourished over the past thirty years, in this millennium, the artist shows no signs of slowing down. He has composed for the Harry Potter films and the theme for the opening of the Walt Disney Concert Hall. The Harry Potter music has been arranged into a concert suite geared toward teaching children about the symphony orchestra. 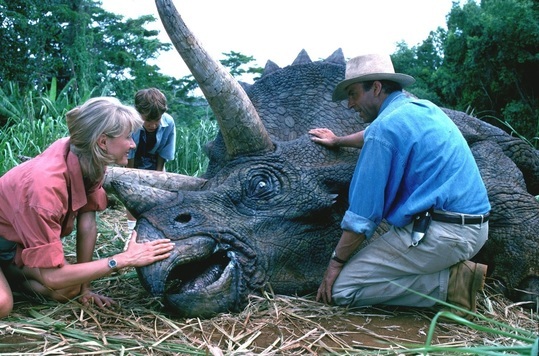 Unlike Williams' rousing, heroic themes, Jurassic Park begins with a theme of quiet tenderness that slowly and gently builds to a more majestic representation of the dinosaur world. 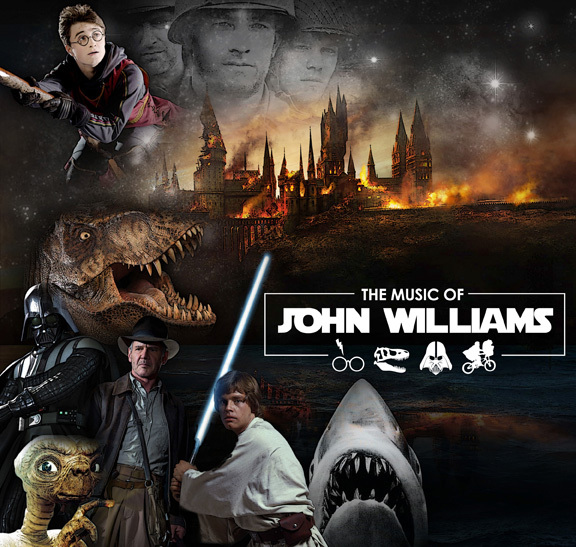 John Williams is heard in concert halls, on promenades, in album collections, on radio, in sports arenas and parades. His musical creativity has provided support for disaster, suspense, science fiction, drama and historical films. The awards and honors he has achieved are too numerous to list. 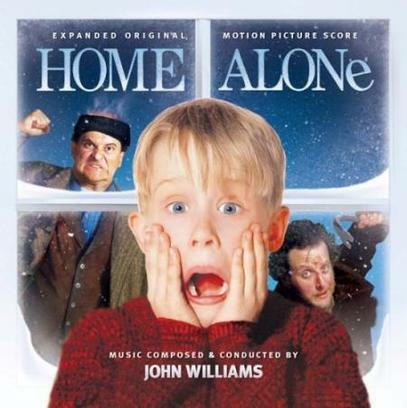 Williams showed his ability to write beautiful, poignant music when he composed the theme song for the film Home Alone. "Somewhere In My Memory" begins with bell-like sounds that bring to mind the magic of a music box. 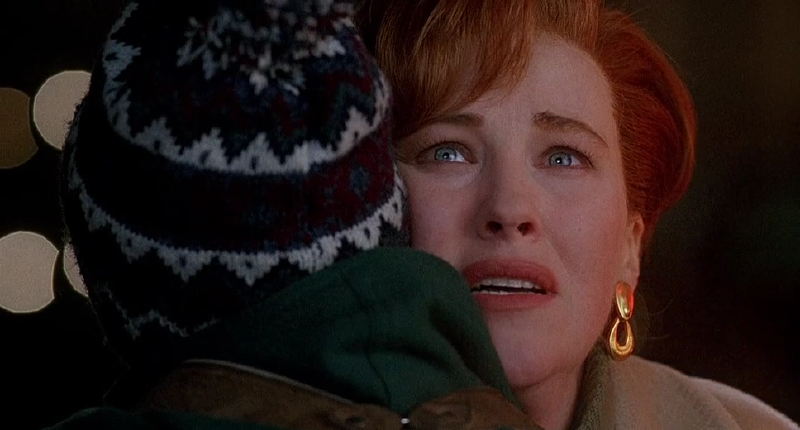 The tender melody and song lyrics evoke the images of the holiday season. 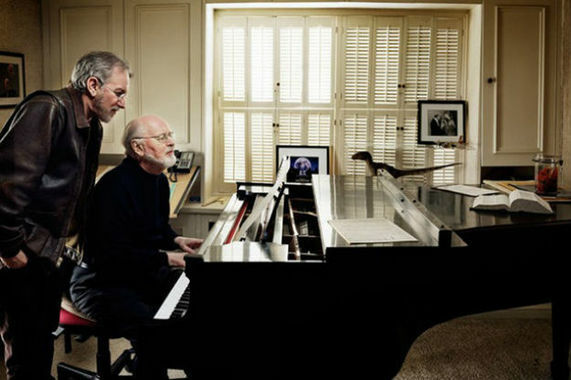 John Williams will remain somewhere in the memory of millions of people around the world.